The popular middle eastern dip or spread, hummus, is generally made from just a few simple, and rather healthy ingredients. The main component of hummus, which gives it its bulk, is finely mashed or pureed chickpeas. Healthy doses of olive oil, minced garlic, lemon juice, salt, and tahini are generally added to the flavor and smooth the dip into a spreadable, delicious dip. Mixed together, does this make for a low-calorie food? Not necessarily, but that does not mean that hummus should not be a part of a healthy, low-calorie food plan. If you look at the nutritional facts on a commercially prepared hummus, you will find that, per tablespoon, hummus contributes around 25 calories. This does not seem like a lot of calories, but most of us would probably eat several tablespoons if using as a dip. So, you may easily eat upwards of 100 calories or more to enjoy a serving of hummus. In moderation, hummus can be a very healthy addition to your diet, and some studies have even shown that those who eat hummus regularly are more likely to be healthy eaters and have smaller waistlines. The New England Journal of Medicine also found in a study published in 2013 than 30% of heart attacks, strokes, and death from heart disease could be prevented if people followed a Mediterranean diet high in olive oil and beans like that found in hummus. It's no surprise as there are so many health benefits that come from the ingredients in hummus. Chickpeas are high in protein which can help you feel fuller longer. They are also high in iron, and dietary fiber which is excellent for digestive health. Olive oil is high in healthy monounsaturated fats, helping you keep your heart healthy and reducing the risk of cardiovascular disease. So, next time, skip the ranch dressing and instead eat one of two tablespoons of hummus with a few raw vegetables for dipping, and you have yourself a healthy and nutritious snack (though do watch the sodium content, as some commercially prepared varieties can be quite high in sodium). If you would still prefer to make hummus into a lower calorie food, try making your own. Replace some of the olive oil with low-fat plain yogurt, and save yourself a few calories. Try different hummus recipes such as cucumber hummus or black bean hummus to see which kind you like the most. Keep in mind, however, that chickpeas alone contain around 270 calories per cup alone, so it's not possible to make hummus really low in calories as chickpeas are the main ingredient. But, the chickpeas are a healthy source of those calories. 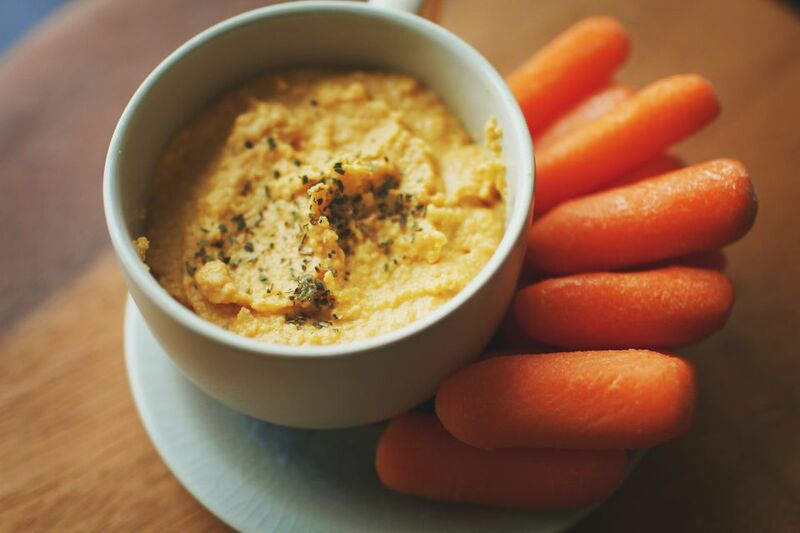 Another way to save yourself a few calories while enjoying some hummus is to dip with fresh, raw veggies instead of pita bread. You'll save calories, and boost your vitamin and mineral intake by adding servings of vegetables to your diet.